Are you familiar with transom windows? These are the small windows (also known as clerestory windows) that you’ll frequently find above other windows. 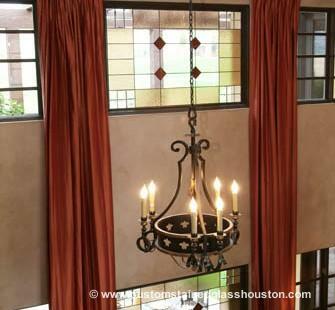 They are one of the most popular places to add stained glass in Houston homes. Transoms are usually high up on a wall or above a door, and do not open. You will also find them above kitchen windows or sometimes in stairwells, to let some light into that area. They can be rectangular, square, oval, or even triangular. The front door is one of the place transoms are frequently installed. Transoms are great because they let more light into the home. They allow sunlight to enter even if the main window has its curtains drawn. They also provide interesting design elements to your rooms, and sometimes, interesting design challenges as well. Stained glass provides the perfect solution – beauty, visual interest, color and texture, but still allowing filtered natural light to enter. Adding stained glass to your Houston transoms is a unique way of adding value and custom designed artwork to your home. What if your transoms create a loss of privacy, allowing neighbors to see into your home? Again, stained glass is the perfect solution. Along with the colored leaded glass that most people think of, Scottish Stained Glass also designs using clear glass in a large variety of textures and degrees of opacity. 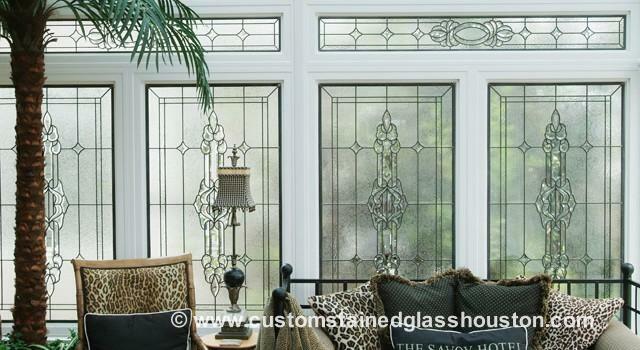 Clear, textured or beveled glass transoms provide instant style and grace to your home. The patterns can be traditional, such as Art Deco, Art Nouveau, Celtic, or floral.These designs add a more classic elegance to your home, with a hint of times gone by. If your home is modern and minimalist, we can custom design patterns to match, using free form or geometric designs that add a unique, arty ambiance. Whatever your décor, we can create stained glass designs to complement it. There’s one more reason why stained glass transoms are so popular – they provide a way to add distinctiveness, color and interest to the aesthetics of a room without a big cost investment. Stained glass transoms and windows are the perfect privacy solution for sun rooms. They turn a room which can sometimes look rather plain and utilitarian into an elegant extension of your sophisticated home. Adding the beveled or textured glass to these windows affords another level of insulation as well, holding the heat in during Houston’s cool winters. Each piece of stained glass we produce is custom designed and manufactured to your exact measurements and exact design preferences. You’ll work with one of our Houston designers to create the look that is perfect for your home or office. Installation is quick and simple, with most windows taking no more than a half hour to install. Scottish Stained Glass is the largest custom stained glass studio in the U.S., employing local Texas artisans to produce your panels. We invite you to browse through our Gallery of exquisite designs, then call or email us today and get a free estimate, or schedule a free in-home consultation.